A lot of people get married for the wrong reasons. This topic of discussion has come up amongst my various circles of friends so I decided to write a post about it. “I didn't want to lose him and I thought it would make me happier. I already invested so much time and energy into the relationship." “We have kids together and I want them to grow up in a two-parent home." And I’m probably sure some women were just happy they “got chose” no matter how many red flags they chose not to see (I hear the dating world is hard out there). Marriage made them feel validated. Getting married for the wrong reasons leaves broken homes, tumultuous divorces, or unhappy people who feel stuck because they don’t want it to negatively affect the kids. Well, if you’re considering marriage or at a crossroads, keep reading. Really think about why you want to get married and if you’re marrying the right one. Part of the blame for this is the perception and expectation we have of marriage. We think that it’s wonderful (and it can be but not always) and we’ve practically been conditioned since birth to think of marriage as the end all, be all. And watching others like the #ForeverDuncan couple will have you melt. Many enter a little too lightly without asking themselves am I ready and prepared for what’s to come. Do you have dreams of walking down the aisle in a beautiful dress with a handsome, teary eyed fiance’ waiting to trade in his life? Ya’ll walk into the sunset and then what? The real deal is that marriage is wonderful but it’s not for the weary. What’s important is life after the wedding is over and you return from your honeymoon. I’m 7 years in so I can speak on it. If you are considering marriage, keep this in mind - Love ain’t enough. Let me explain before you think I’m crazy. Love is at the core of marriage. It’s part of the foundation, along with God. It’s what makes you want to be together but it’s not always what keeps you together. There will come a time when life happens or when the sh*t hits the fan. Will you be ready to run away or roll your sleeves up and work with your partner to clean up the mess? It takes more than love, it takes loyalty, sacrificing your wants for your mates, constant forgiveness, accepting them for exactly who they are with all of their issues, whether from previous relationships or childhood, etc. It takes true friendship, something that keeps you there during those times when you feel like you’ve fallen out of love. If you want more, read this awesome post from Black Girl, Create. Marriage is not a cure. Whatever problems that existed in your relationship before you got engaged does not mysteriously go away when you say “I do.” If he had a constant problem cheating with other women before, it’s not very likely that it won’t happen again at some point during your marriage, no matter what you do. Why do you REALLY want to be married? It shouldn’t be to make yourself complete or happy. Learn what makes you whole so you are not giving half of yourself to a person. Marriage shouldn’t be something to do because you’re approaching 30+ and your family is giving you the side eye at every get-together because you’re “shacking.” Or not because you already have kids with a person and you assume they aren’t going to pick up on the fact that ya’ll can’t stand being in the same room with each other. But I’m not here to tell you what to do. What are your thoughts? I’m curious. Let me know in the comment section below. Ladies, Why Are We Expected To Be The Tolerant Ones? This statement had me thinking - Why do we, as women, tend to be more tolerant than we should in a marriage? We are often the ones who sacrifice our happiness for the betterment of the relationship. We are the ones who are taught to be submissive, who are encouraged to “stick it out” with our men who have often make mistakes and (for a lack of a better phrase) don’t have their sh*t together. Men, similar to Kirk, who took 20 years to actually grow up and learn how to be a good husband. From the looks of several Facebook comments under the post, I wasn’t the only one with these same thoughts. What would happen if the tables turned? Would he be expected to have the same patience with his wife? To be just as tolerant and give her several chances to get her act together? I don’t think so. In a marriage or relationship, this is such a double standard. If a man cheats (and more than once) a wife is led to forgive her husband, do what is best to keep the family together, to stick to the vows they made on their wedding day. And she might even hear the oh so common “It’s in a man’s nature.” But dare a woman to cheat and a man is ready to leave like a blink of an eye. Is he given the same speech on staying together? To be more tolerant and give her a couple of chances to mature?I don’t think so. Men get away with so much foolishness because there are women who put up with too much. Demand better and you’ll get better. Tolerating too much clearly worked for Tammy but would this outcome be the same for all women? I don’t know if that would’ve worked for me. I would love to hear about this from her perspective. Don’t get me wrong, everyone makes mistakes and in marriage, commitment and loyalty is everything. But it has to be 100% from both partners. POINT. BLANK PERIOD. A balanced marriage is one that is a 2 way street. It consists of two imperfect people and it’s not always easy. A wife should not be the only one in the marriage who is constantly tolerant if her husband is not doing the same in return. Double standards should not apply. Choosing to stay committed with someone who struggles with issues in themselves requires much strength and the patience of a saint. Really, should women be expected to be more tolerant? How long do you wait for a man to “grow up”? Let me know your thoughts. I love it when one of my friends meets a guy, they hit it off, start to date and it turns into something serious. Sometimes I get a bit nosey and ask, “Do you love him?” or “How does he feel about you?” Now, if they reply “I think so” or “I’m not sure.” That may be a red flag. This post is for my ladies who have doubt stirring through their minds about how their significant other feels about them. Yes, I’m offering my unsolicited advice but you’re here so just keep reading. I’ll just cut to the chase…If you EVER have to question how a man feels about you, he’s NOT the one. When it comes to truly loving someone, it’s either a yes or no. POINT. BLANK. PERIOD. There’s no in-between. No gray area. No scratching your head, pondering over it like you’re trying to figure out a cure for Ebola. I know how it feels to be in a “situationship” where your heart is like crap because you aren’t certain if the person you love so much feels the same about you. You find yourself doing some of the dumbest ish you probably would never do just to prove your love. In the end, you still are left wondering if you’re enough. Girl! Been there, done that, got the t-shirt and the key chain and I’m not going back! 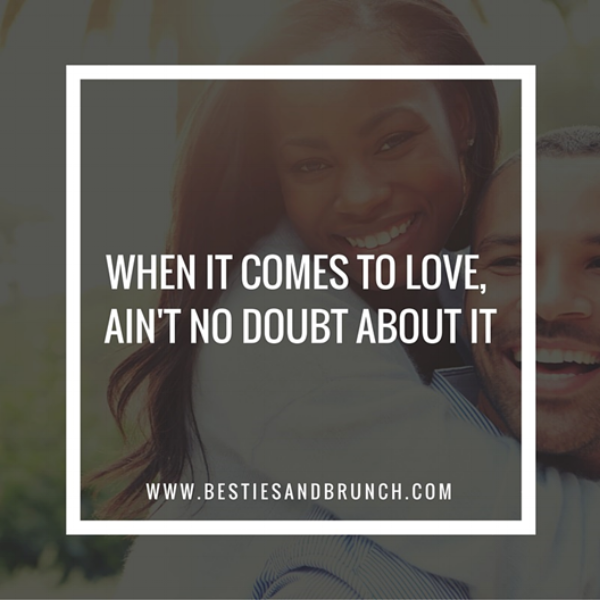 We all have different love languages or how we show our love (side bar: if you don’t know what your love language is, you can take a quiz or read 5 Love Languages) but the one simple thing about love is knowing that it exists in your relationship. When it comes to my husband, I know without a shadow of a doubt that he loves me. Not because he says it (words of affirmation are not my love language) but because he shows it through his actions every day. If a man loves you, he will go out of his way to make sure you are ok. He may think about your comfort before he thinks about himself. He’ll treat you the same in front of his friends and family as he does when you are behind closed doors. He is honest and cares about your feelings. He respects you as his significant other. If it don’t feel like After 7’s Ready or Not (my fav old school R & B love song) or Tony, Toni, Tone’s Whatever You Want then it ain’t hitting it. Lol! I could go on and on. If you find yourself in this predicament where your boo has left you unsure, outright clueless, or ashamed to say that he loves you and cannot state his intention with you, then it’s time to move on. Yes, it’s easier said than done but know this - You are worth having someone who loves you without a doubt. You are worth someone who has no qualms about expressing their love to you, whatever their love language. Real love is possible. It won’t cause you to wonder, you won’t have to walk over hot lava with gas feet to get it or ever write “it’s complicated” in your relationship status on Facebook. You are worthy of love! And it ain’t no doubt about it.